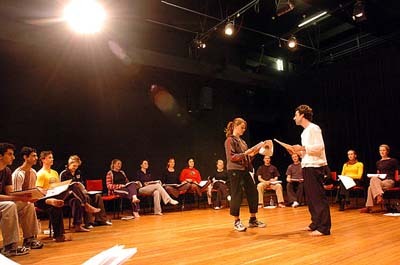 This course provides a basic introduction to the work of Stanislavski, exploring script analysis for the actor as well as an experiential analysis of the basic physical, vocal, and analytical tools of the actor’s craft through a series of group and individual exercises, leading to preparation of audition monologues and performance of scenes. This course challenges students to embrace the challenges of improvisation in a variety of theatrical contexts, and to reflect on those experiences through a rigorous engagement with play theory. In a sequence of short units, we will explore improv-based games, improv comedy, improvisation-based devising work, and the improvisation structures commonly used in the context of applied theatre work (including forum theatre, playback theatre, and sociodrama). Simultaneously, we will be reading scholarly literature in the field of play theory, and processing our own experiences as improvisers through the vocabulary that has been developed in this interdisciplinary field. This course is a survey of theatre history from antiquity to the late 1800s. In it, we will examine the relationship between theatre and society, including how theatre both reflects and shapes the world outside its walls, and vice versa. This course focuses on reading plays, critical essays, and historical documents, as well as essay writing and a final project. We will address questions of physical performance space, performance style, audience, the development of design, and the political and social consequences of making theatre at different moments in history. Lecture-conference. This course examines the history of the anti-apartheid struggle in South Africa in order to critically question the role that activist theatre and performance played in advancing social and political change. As they engage with the historical specificity of this topic, students also consider the broader questions of how social/political change happens, and how theatre makers can most effectively contribute to that change. Students will study a broad range of dramatic literature, including plays, musicals, and solo drag performances, in addition to studying political street demonstrations as performances. They will also read and consider analyses and reviews of these performances, and social/political theory by Paulo Freire, Theodor Adorno, Benedict Anderson, Jill Dolan, and Laura Edmondson. The final project asks students to leverage their insights about performance and social change as they create original performance that is tailored to issues of concern in our own place and time. Students will emerge from the course having honed their skills as theatre historians, and having honed their ideas about oppression, activism, and performance. This course is an investigation of approaches to script analysis and directorial tools for working with actors in bringing a text from page to stage. We will explore the process of developing and implementing a production concept: its formulation through analysis, rehearsal processes, and realization in theatrical terms in performance. Lab work will be supplemented by relevant writing by influential directors. This course engages students in an experiential study of devised theatre, a contemporary practice wherein a creative team (including actors, designers, writers, dramaturgs, and often a director) collaboratively create an original performance without a pre-existing script. We will explore how an ensemble uses improvisation, self-scripted vignettes, movement/dance, and found materials to create an original piece of theatre. Students will engage in a reflective practice that integrates the processes of research, conceptual design, creation of original work, reflection on that work, and reading about the process of devising. 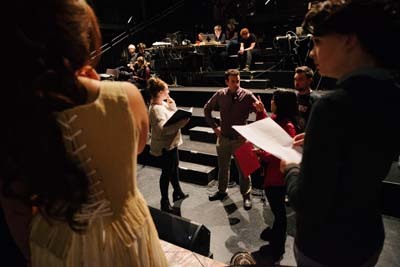 Theatre Laboratory is a class in which students, faculty, and staff work together to create departmental stage productions. In this class, students learn about different parts of making theatre—from onstage to backstage work—that are required to make a theatre production. Students also learn the arts of collaboration and producing. Students may repeat this course for credit, and each time a student takes this class they can experience a different production role. Roles available include actor, dramaturg, designer, stage manager, assistant director, and more. This course is offered for either one-half or one full Reed unit. For the full unit, students will study critical writing and research about theatre, and write a full-length, rigorous research paper that critically analyzes their process and the performance of their production role.